Stirling University was developed in the late 1960’s and early 1970’s on the Airthrey Estate in Bridge of Allan, north of Stirling. As a result it has a stunning parkland setting, into which modernist concrete buildings of the era were placed. Many of these are now listed, as is the landscape itself. The main body of the original student residence blocks dated from the early 1970s and, while valued for their architectural integrity, offer a relatively poor quality of accommodation. The University therefore embarked on a major redevelopment programme to demolish and replace some 700 bed spaces in a rolling programme over 3 years. Woolgar Hunter were engaged as Civil and Structural Engineers on this development, working with Lewis and Hickey Architects. The accommodation brief had to provide for the varying requirements of the University; student lets, mature and family student lets, and ’holiday’ lets. The holiday period letting provides an important income stream, but required the building to operate more as ’hotels’ than as a series of cluster flats. The architect responded with a design that provided typically 5 bed cluster flats, but also allowed the building corridors to ’open up’ for the holiday let scenario. In addition a development of townhouse and family flats was designed for more mature students. 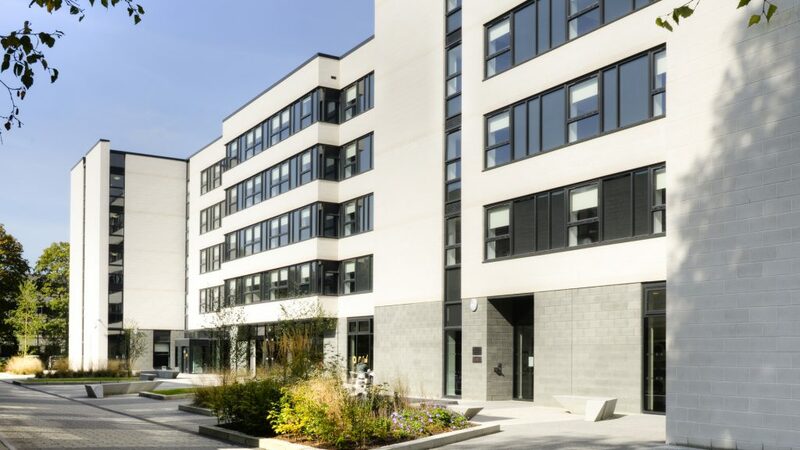 The development was phased to maintain accommodation throughout the build process, with typical blocks being constructed over a 1 year period to tie into the start of the academic year. A variety of structural solutions were considered, and after careful consideration, a ‘slimfoor’ steel frame with concrete floor slab solution was adopted. This provided a ‘ flat soffit’ floor slab for ease of services installation, but also offered the speed of steel construction. This was combined with timber framed in fill wall panels, which were prefabricated and allowed the building to be made wind and weathertight at an early stage. The project was let under a framework agreement as a traditional 2 stage tender.